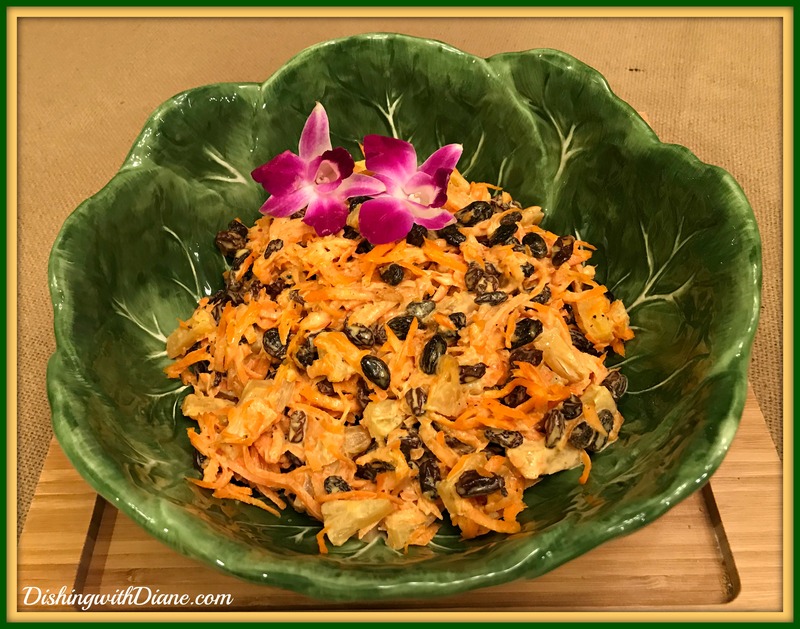 Diane put this post together for her followers before she went to the hospital for surgery. She sends her love to all. She’ll be back soon with new posts. 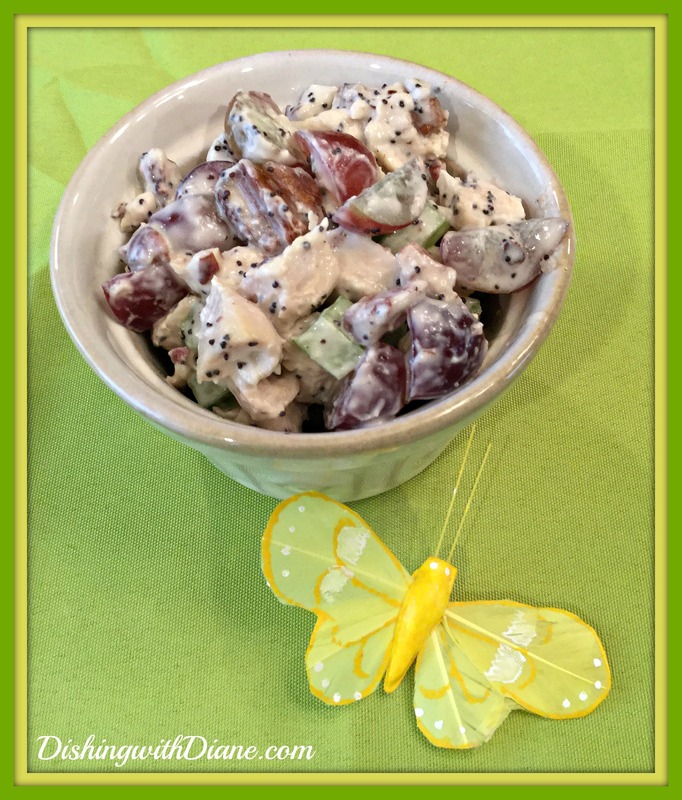 At the end of this post I have included some recipes to help you prepare this luncheon including my Chicken Salad with Grapes and Walnuts recipe. 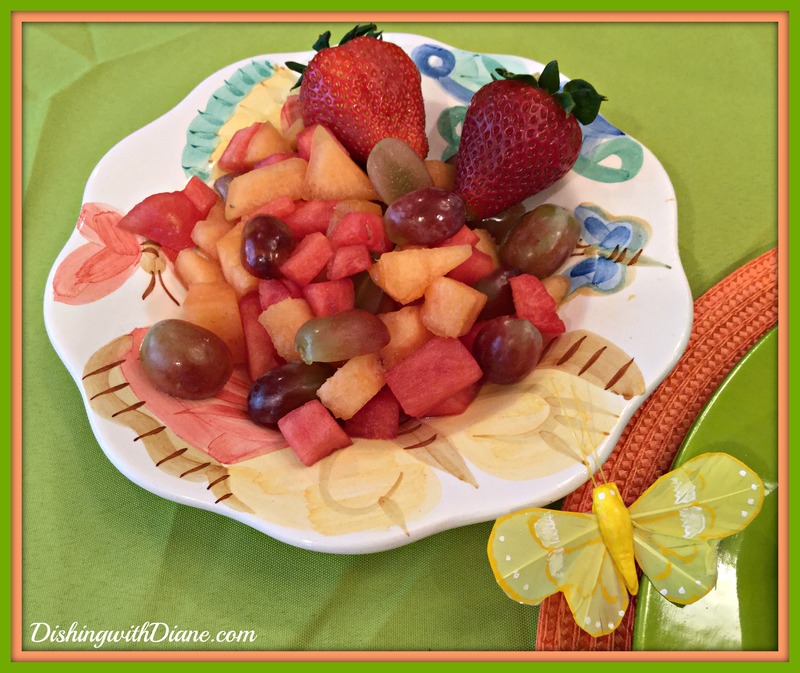 A very easy lunch to pull together and it never disappoints. 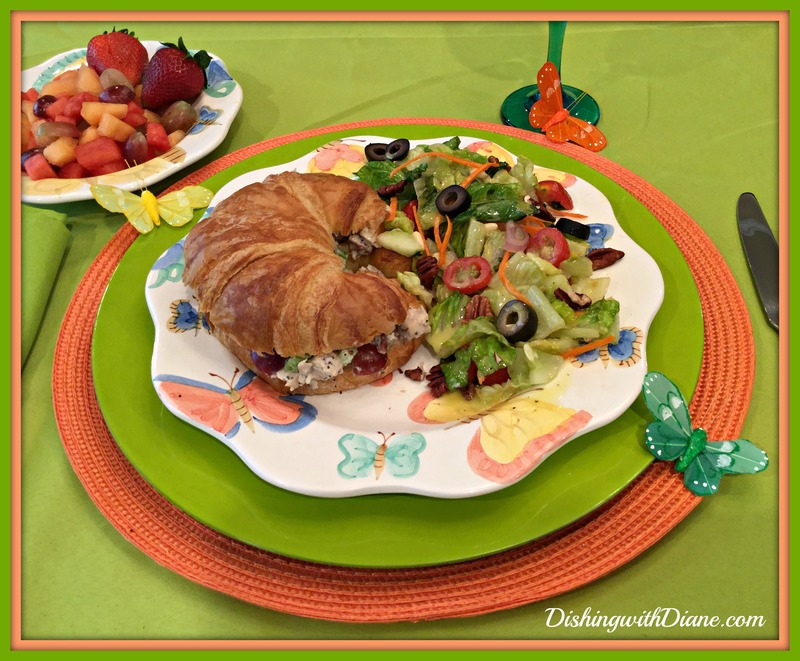 Chicken salad with grapes and walnuts served on a croissant with a green salad and some fruit, and your guests with love it. 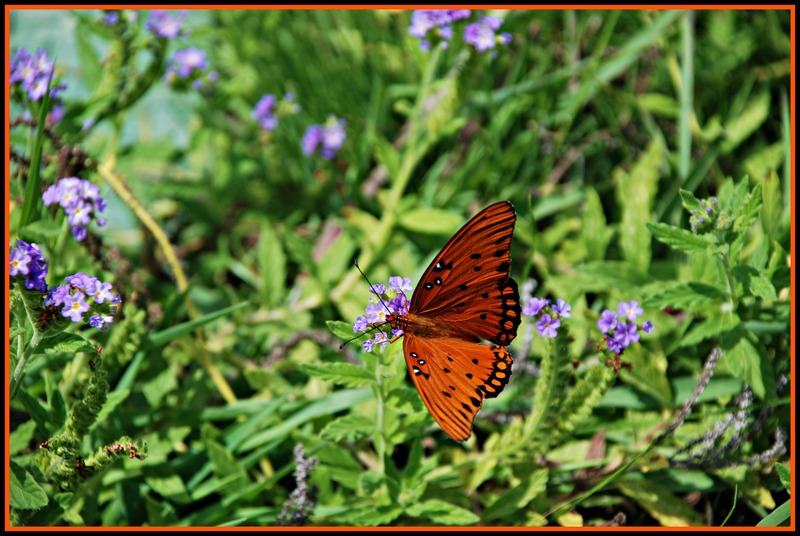 I Just LOVE Butterflies ! 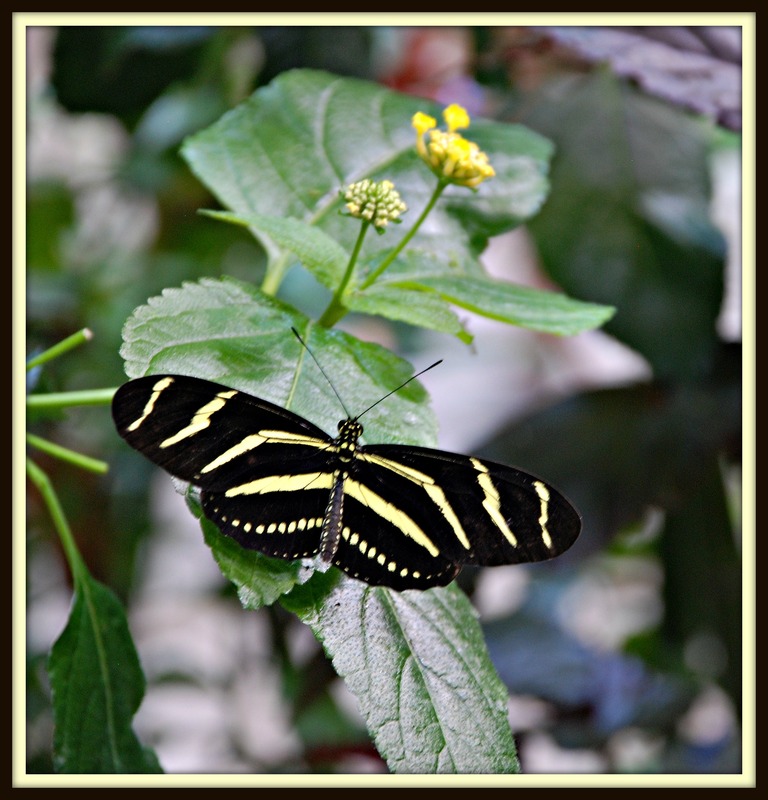 Bob and I have been to many Butterfly Gardens in South Carolina, Niagara Falls and downstate New York. I just can’t seem to get my fill. 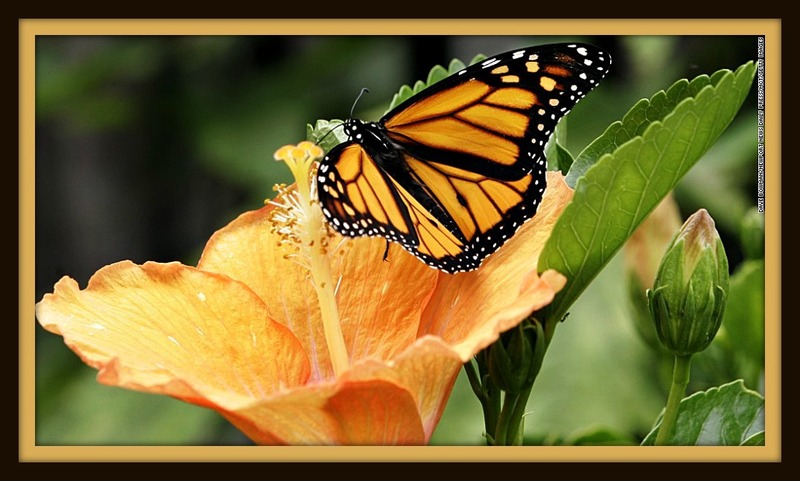 To me, Butterflies are a sign from heaven and are good luck. 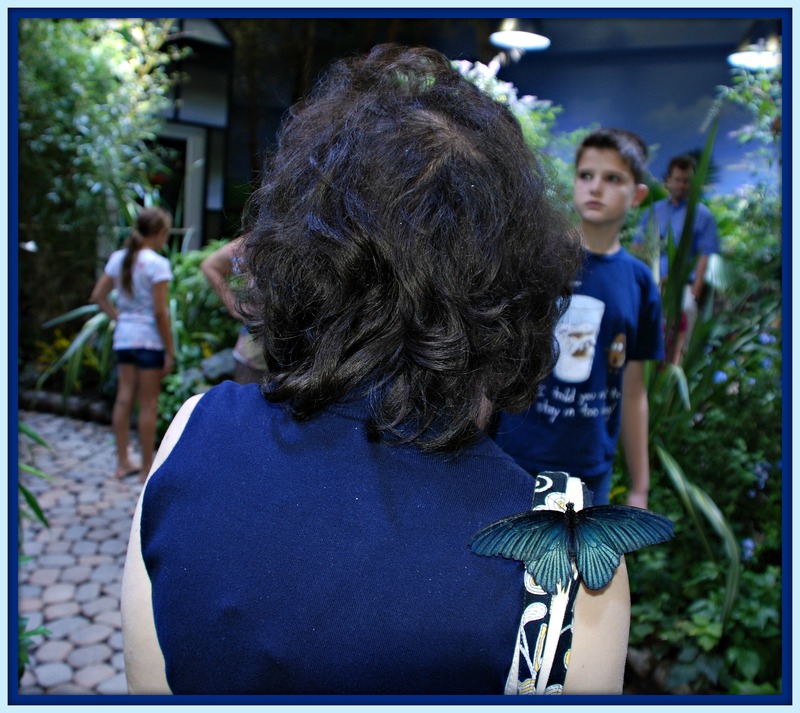 Here is a photo of a butterfly that landed on my shoulder at one of the events, that I thought for sure was coming home with me because it stayed there for hours; but at the last minute, no such luck. 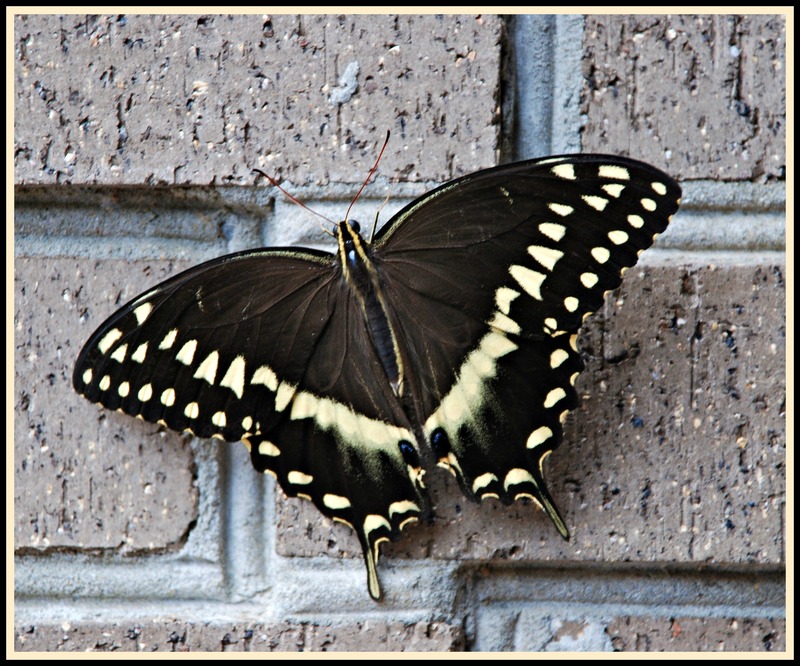 Since Spring is finally here, I am hoping to see more and more butterflies come back to share their beauty. 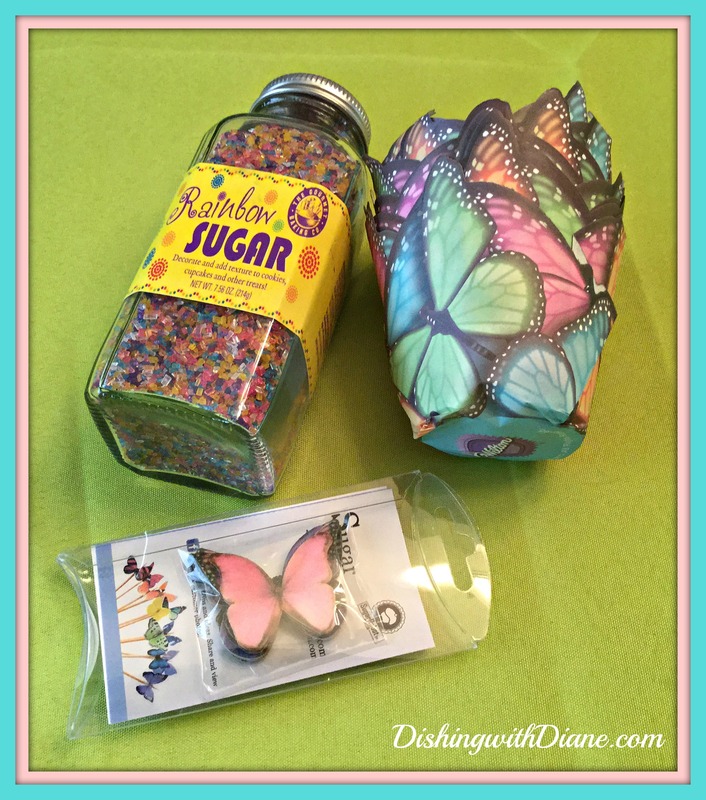 I buy so many items in the butterfly theme, that you could say it is another “collection” (just ask Bob). 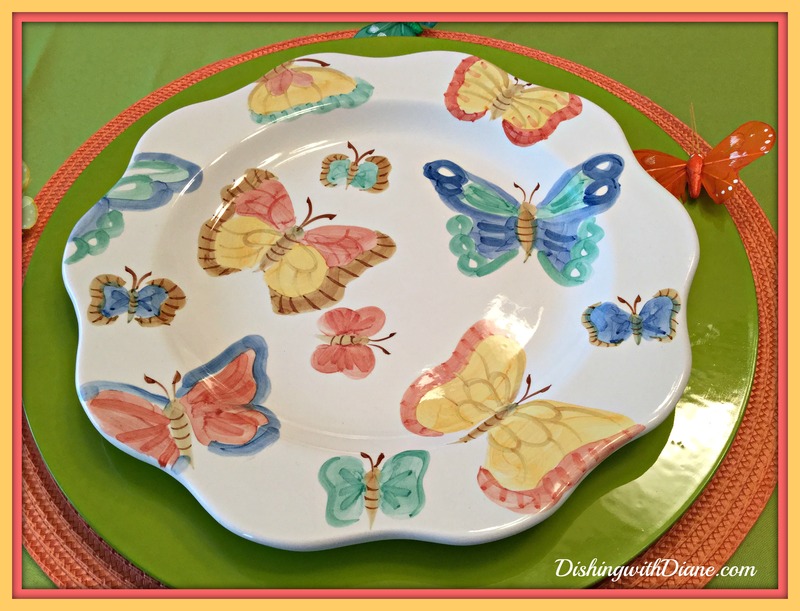 I bought these butterfly dishes many years ago not only because of my love for butterflies, but because I just loved the colors as well. They are simple and cheery and I also love the scallop edge. 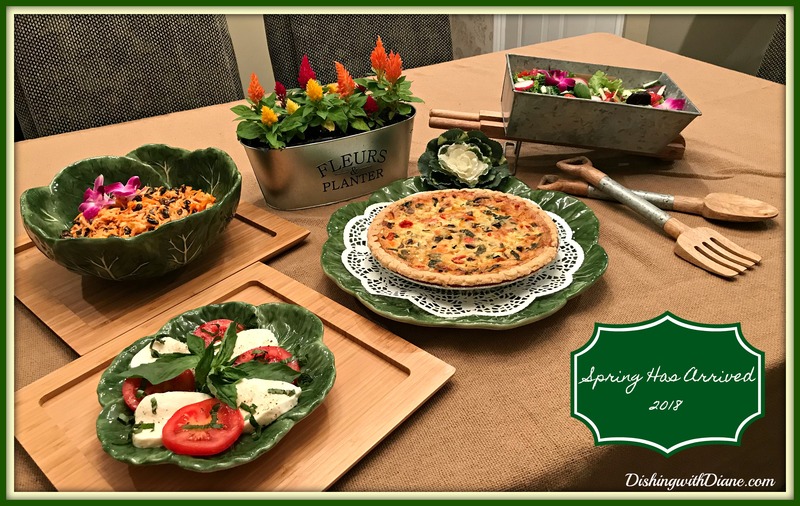 Now on to the tablescape...I decided to use these dishes for a very casual “ladies” luncheon that I was having with some friends. 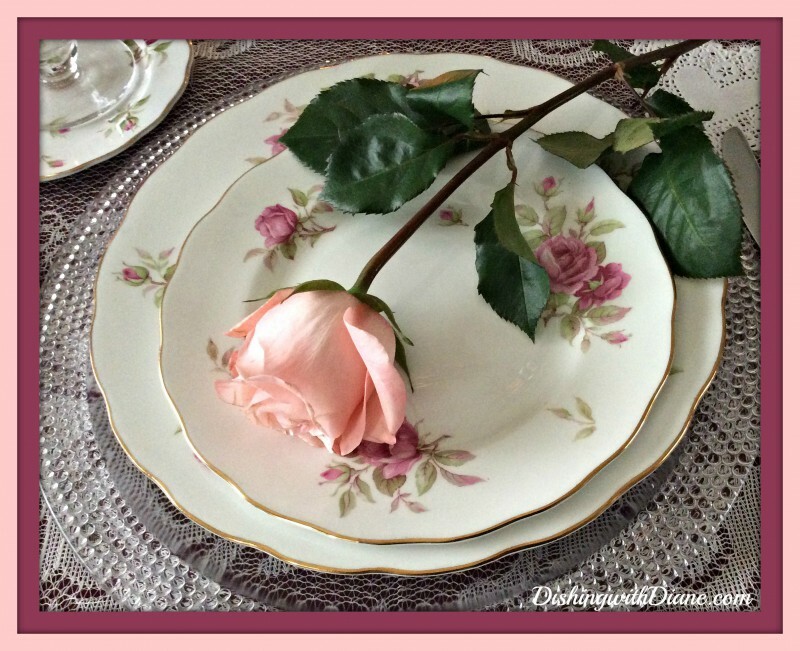 You know the type of luncheon I am talking about, a little girl-talk, a little food, A LOT OF DESSERT. 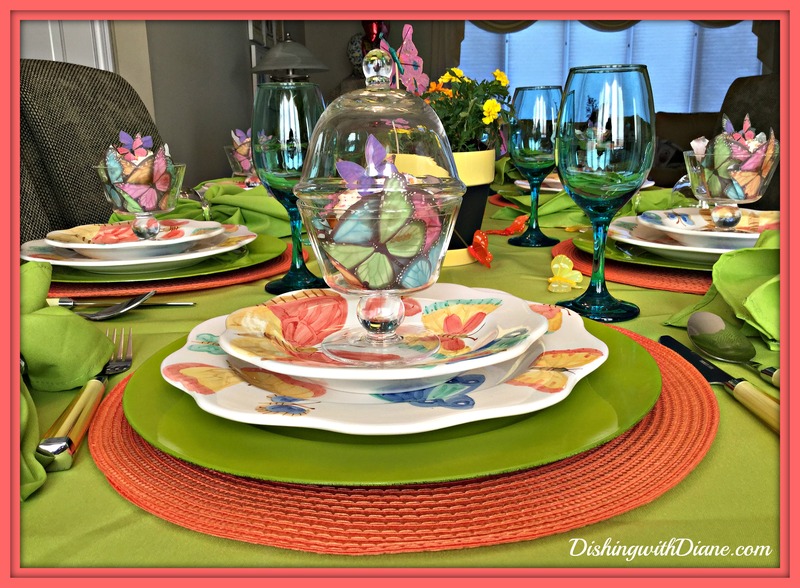 Since the colors are so bright in the dish, I wanted to keep the rest of the table bright too. 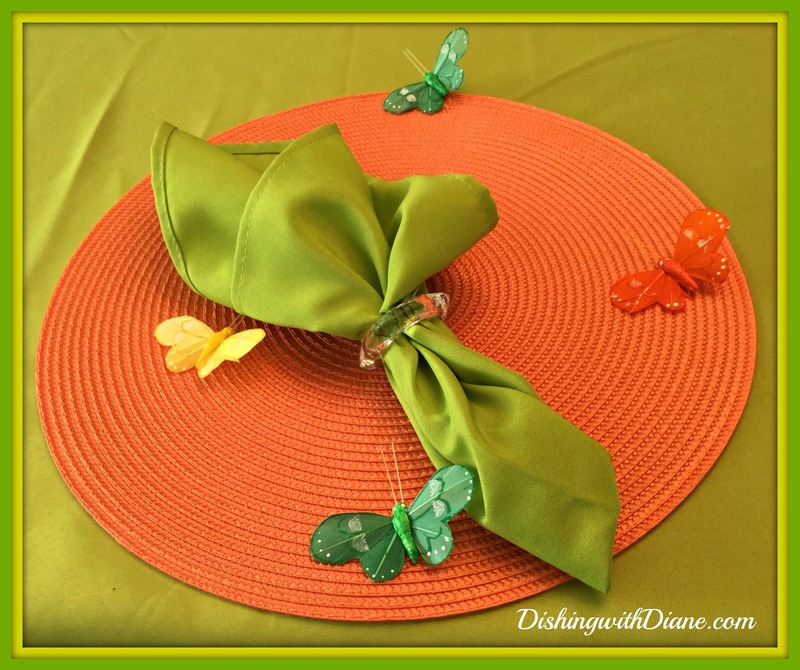 I chose a lime green tablecloth and napkins with simple clear napkin rings. 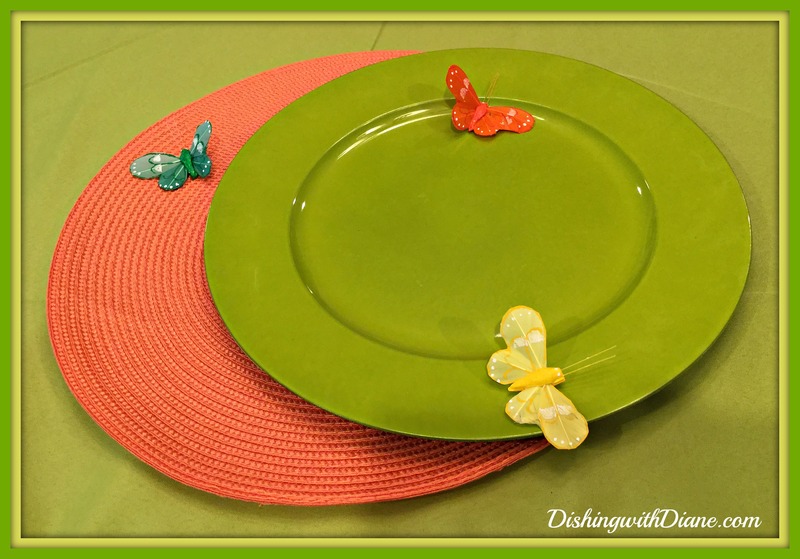 and then decided to use my orange woven placemats with a lime green charger plate. 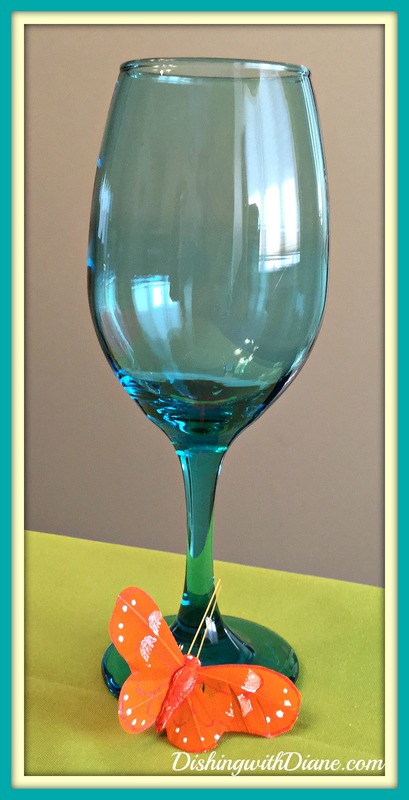 For the glassware I chose bright aqua goblets. 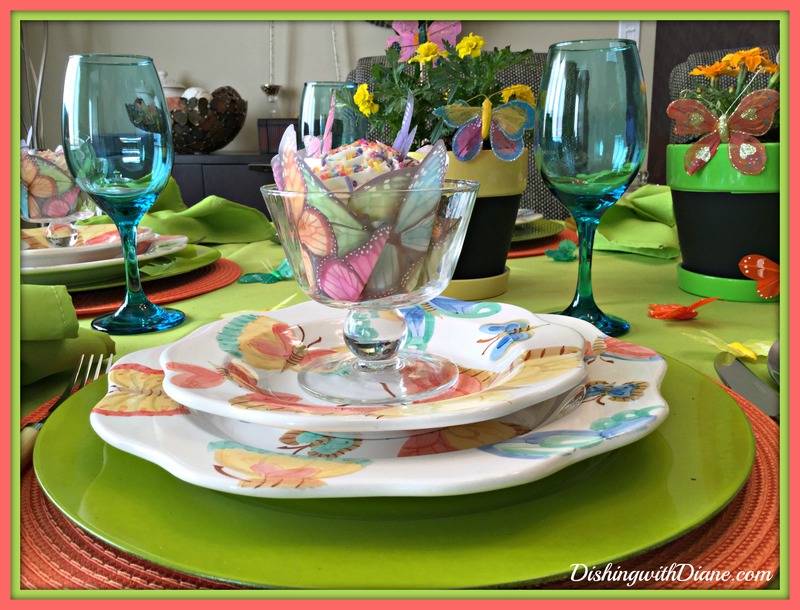 All of these colors together gave the table a sort of a Tropical feel and very upbeat. 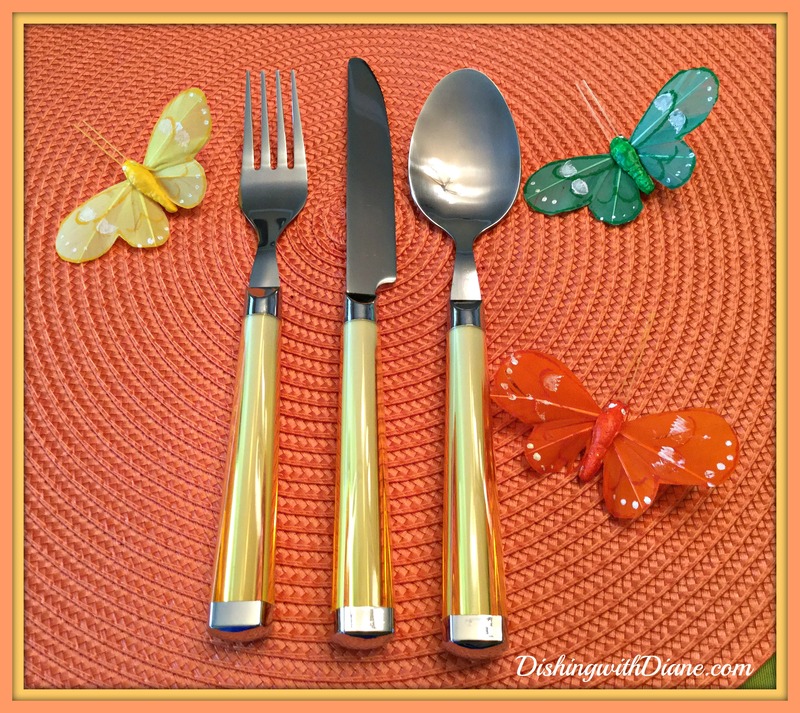 I continued with the bright color scheme using my very bright yellow flatware. Along with the chicken salad and fruit, I wanted to have a special dessert to go with the usual cake, so I bought cupcakes and topped them with edible sugar butterflies and some colorful crystal sugar. 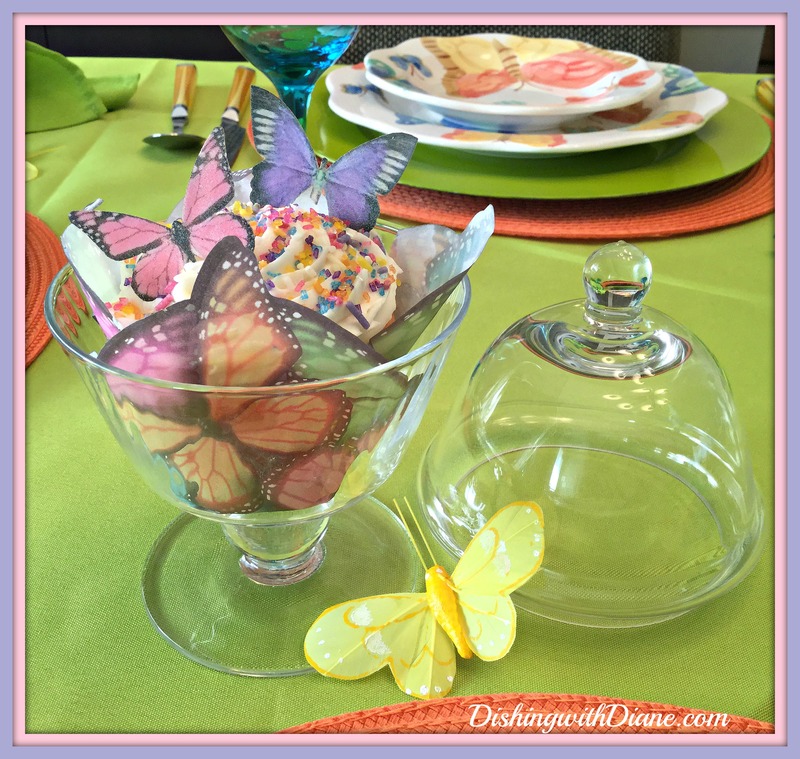 Between my love of butterflies and love of setting a tablescape, I was so excited to find baking cups with a butterfly design while browsing in Michael’s Arts and Crafts that I just had to buy them. (I was so delighted with this find that I think I lost my breath for a few seconds in the store). 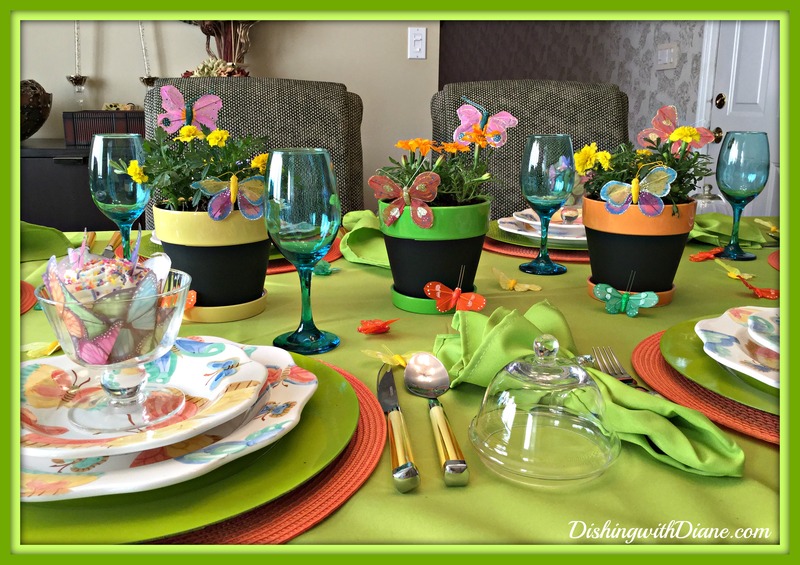 The colors on the baking cups match the butterfly picks that I will be using in the centerpiece. It’s the little things that make me happy. I brought out one of my favorite items that I own, individual glass cupcake holders. 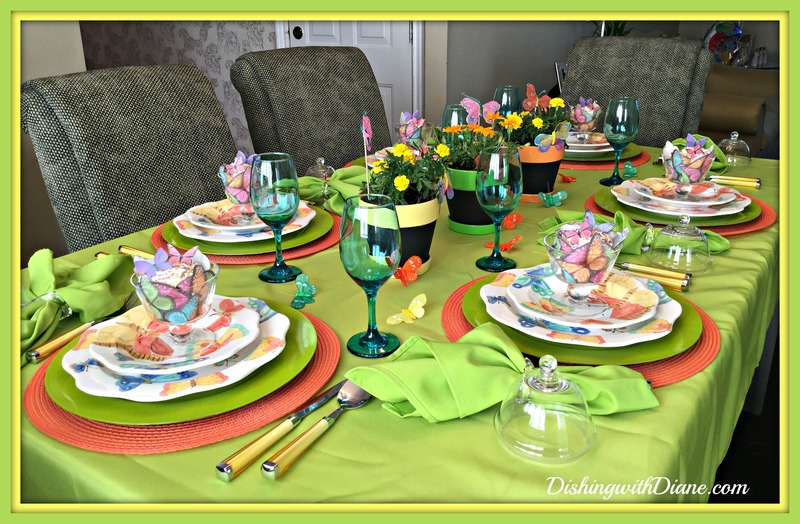 I wanted to display the cupcakes at each place setting during lunch. 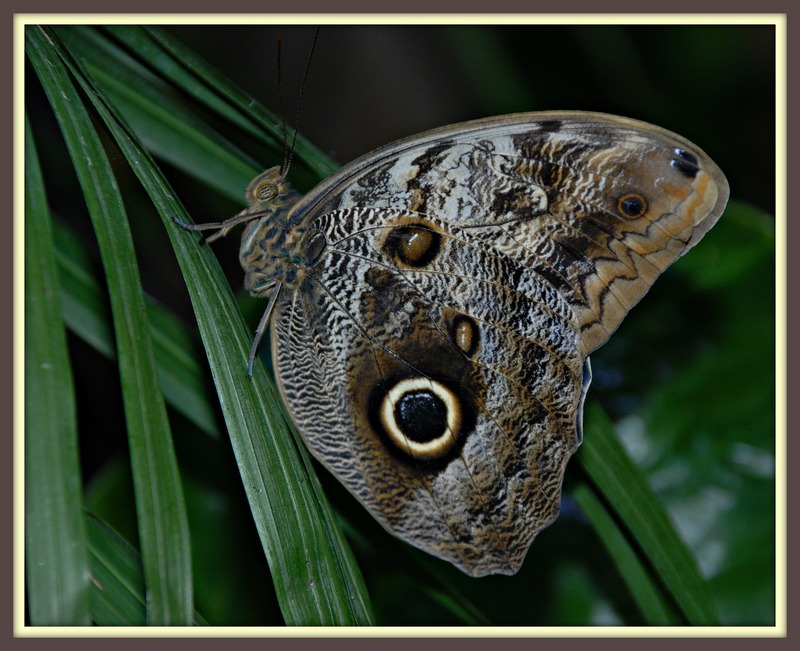 The sugar butterflies are so delicate, you can hardly tell them apart from the baking cups. I had to give this centerpiece a little thought because I didn’t want it to be too high so I couldn’t have a conversation, or see my guests over the centerpiece. 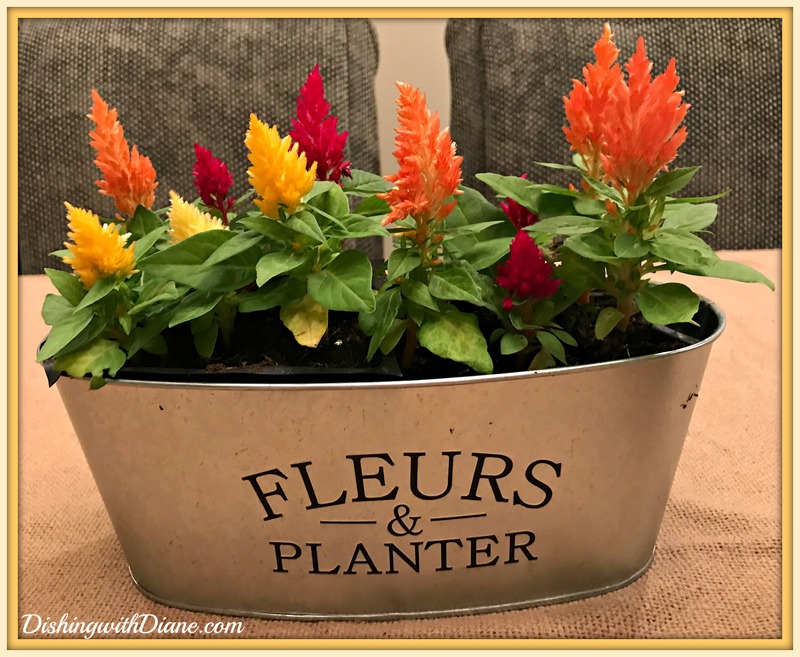 After shopping around the house (in this case the garage), I spotted some colorful flower pots that pick up the colors of the dishes. (Remember, shop your house first). I planted a few marigolds in each flower pot that would be bright and low enough for conversation. 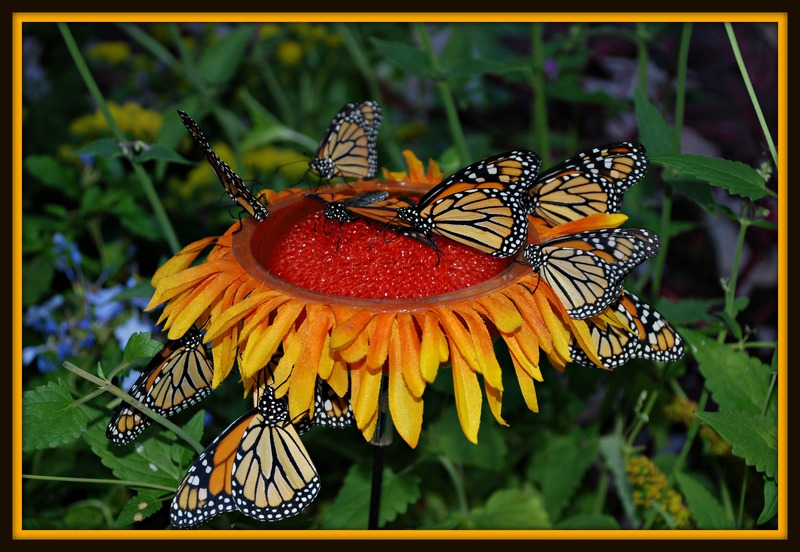 A few silk butterfly picks added to the flower pot and this would work perfectly. The centerpiece would be done. 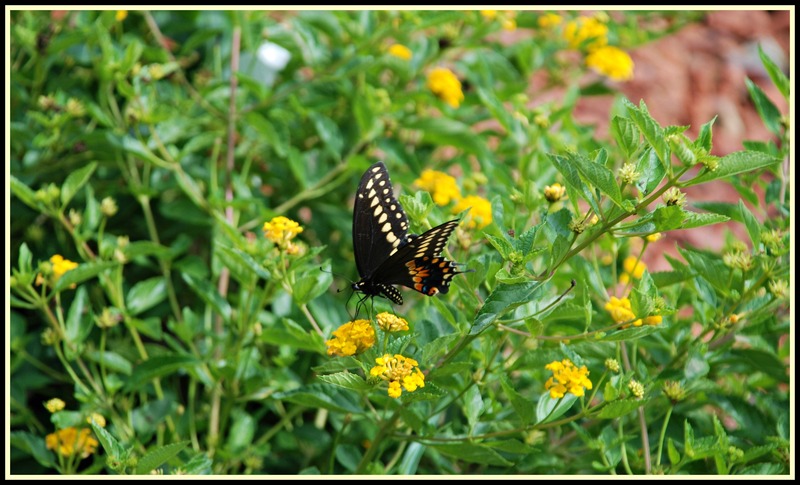 I chose marigolds because they are a hardy plant and since I have a “brown” thumb and kill every plant (except the bamboo-that is still alive), I figured I will have a good chance that they would last until the luncheon was over. 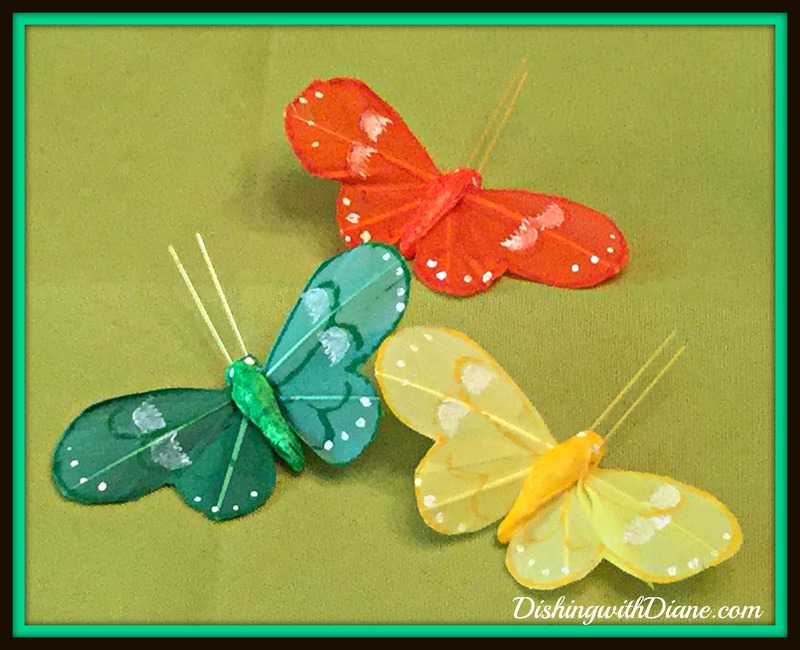 Of course I had to keep the theme going, so I scattered a few more silk butterflies on the table as table confetti…. I made the confetti from garden picks that I just cut the wire stem off of. 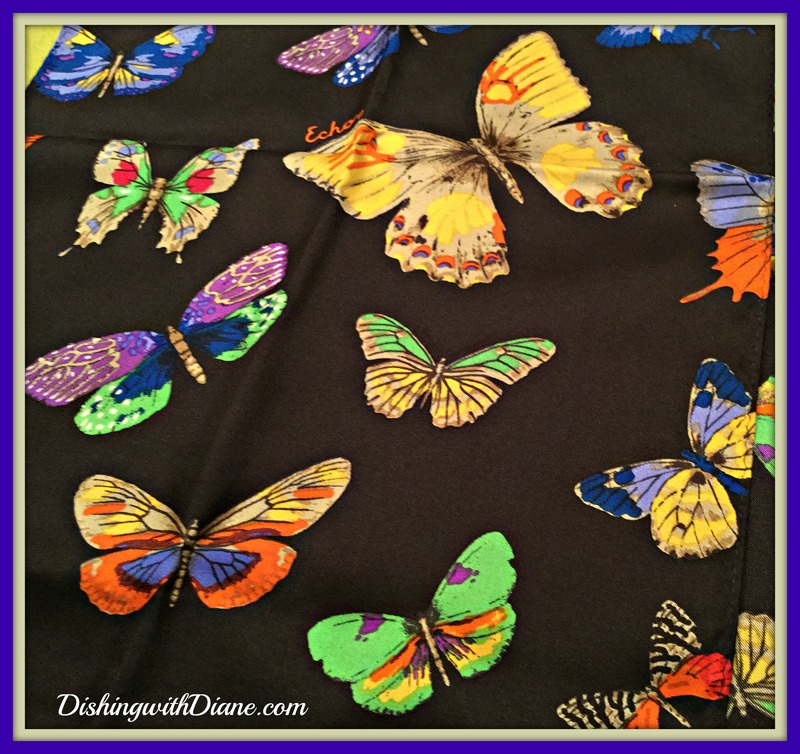 and I wore my Butterfly scarf to the luncheon (I told you I love butterflies). Now I am ready for my guests. 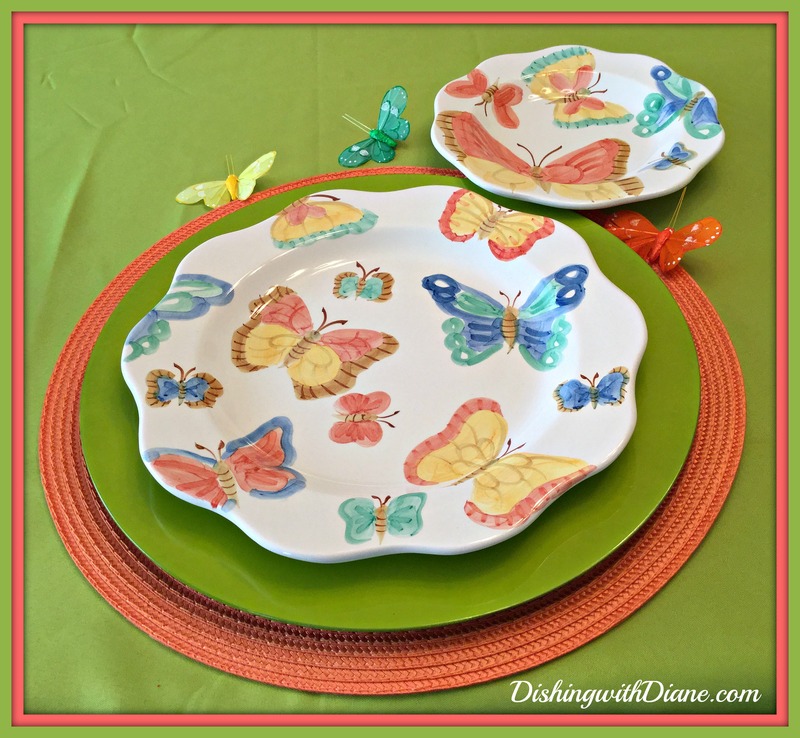 Thank you for letting me share with you my love of butterflies and one of my favorite dinnerware sets. 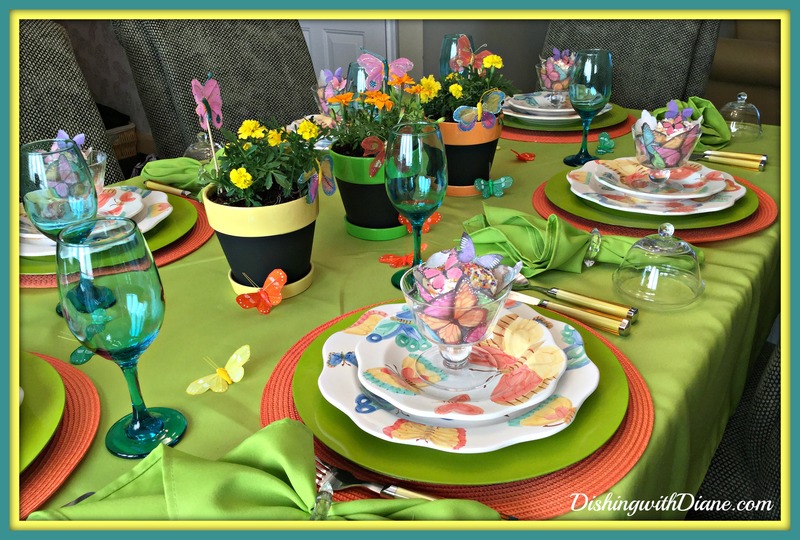 I hope you enjoyed the butterfly tablescape. If you enjoy the posts, please spread the word. 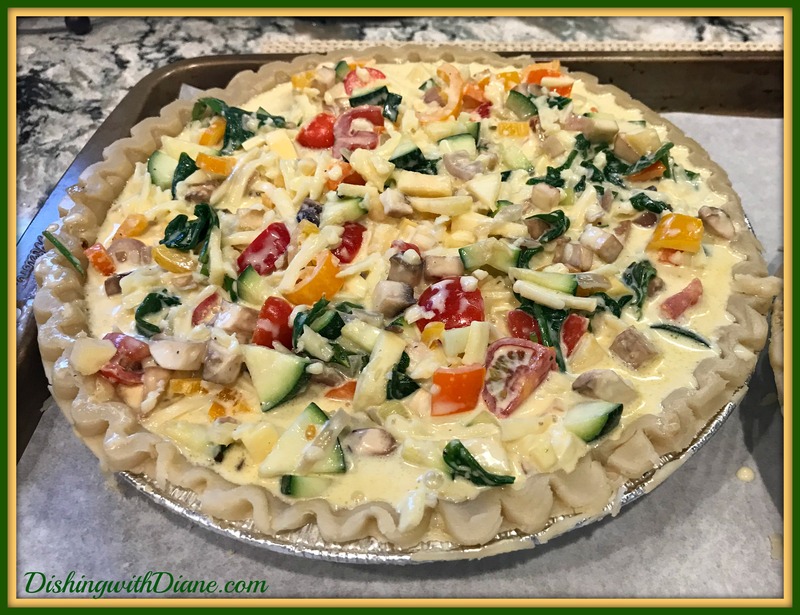 “Like” the DishingwithDiane Facebook page or share it on your timeline and ask your family and friends to follow the blog as well. (PLUS a lot of dessert of course). Below is a photo of what the chicken salad looks like when all combined.You could also serve it on a bed of lettuce. Preheat oven to 375°F. 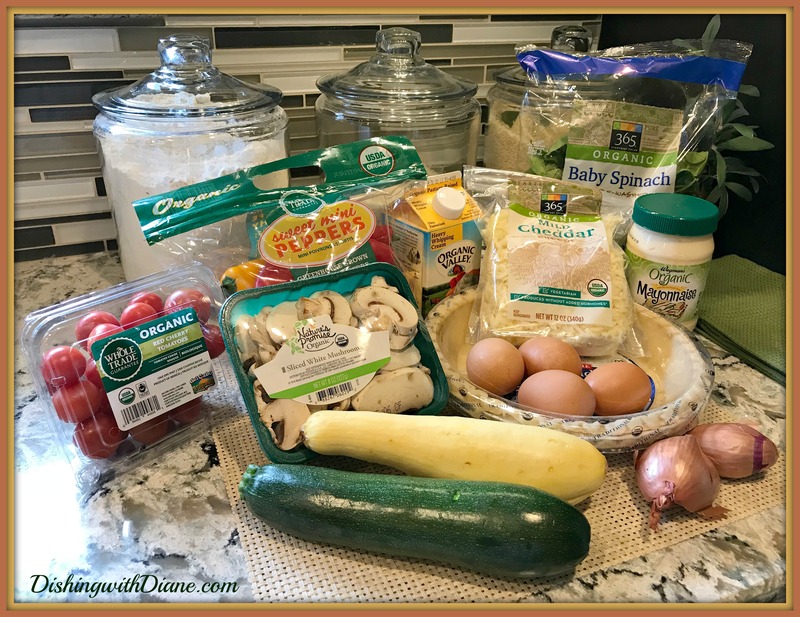 Place the chicken breasts in one layer in a baking dish with 1/2-cup water or chicken broth. Cover with foil and bake 25 minutes until completely cooked through. Remove cooked chicken breasts from pan, cool at room temperature for 10 minutes, then cover and refrigerate. 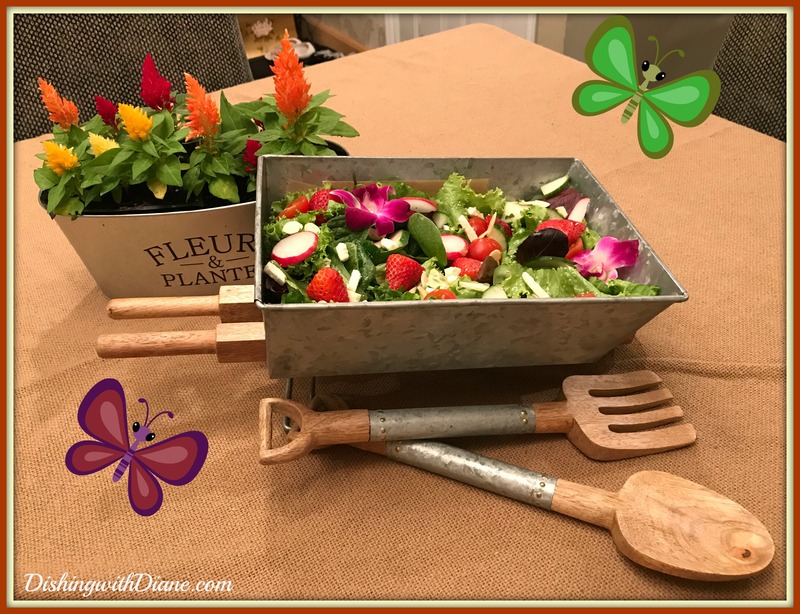 I hate the look of salad dressing bottles on the table when you are having guests; so I always dress the salad right before serving. 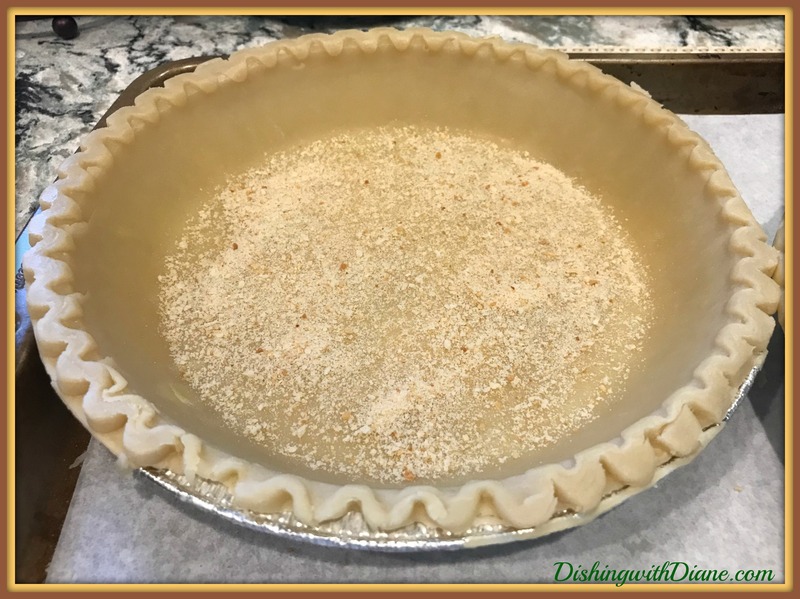 The recipe below is very basic and I always gets compliments. 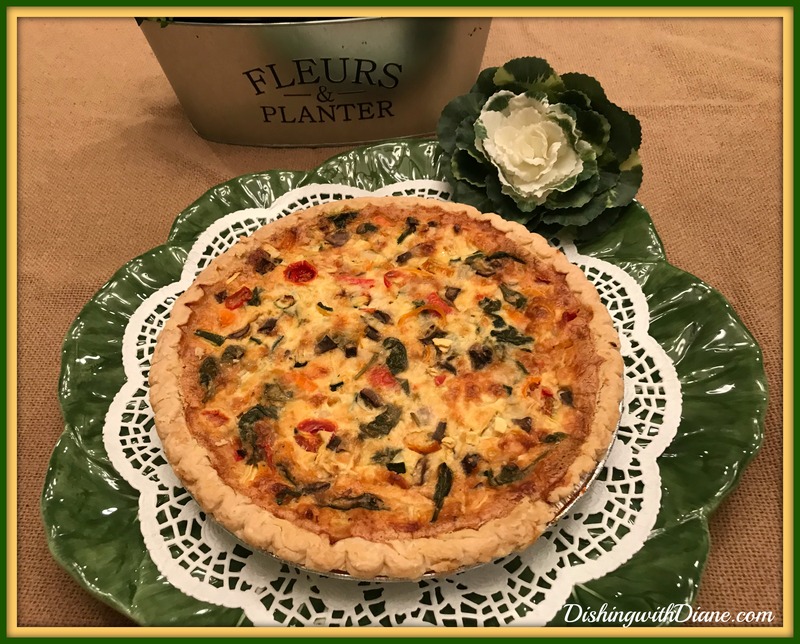 Nice accompaniment when putting goat cheese and fruit in your salad too. 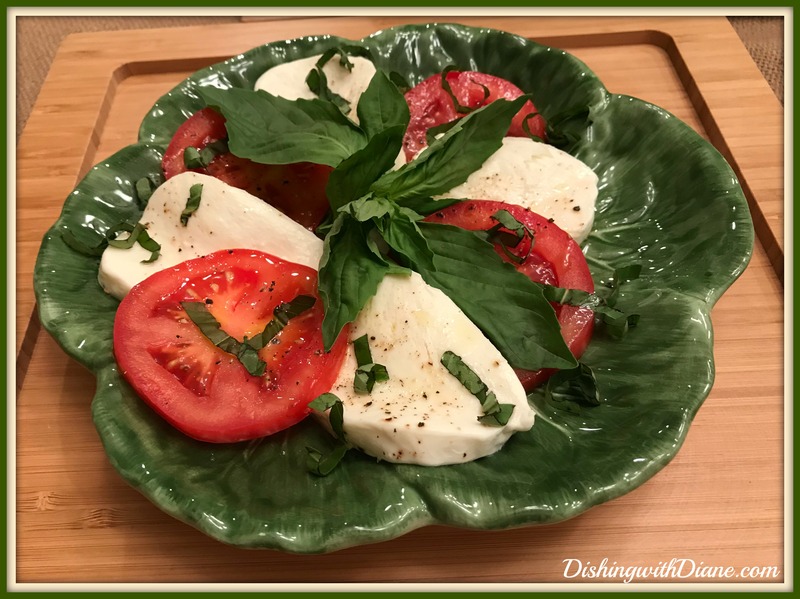 Little tip: If you have a hard time cutting goat cheese, use dental floss. 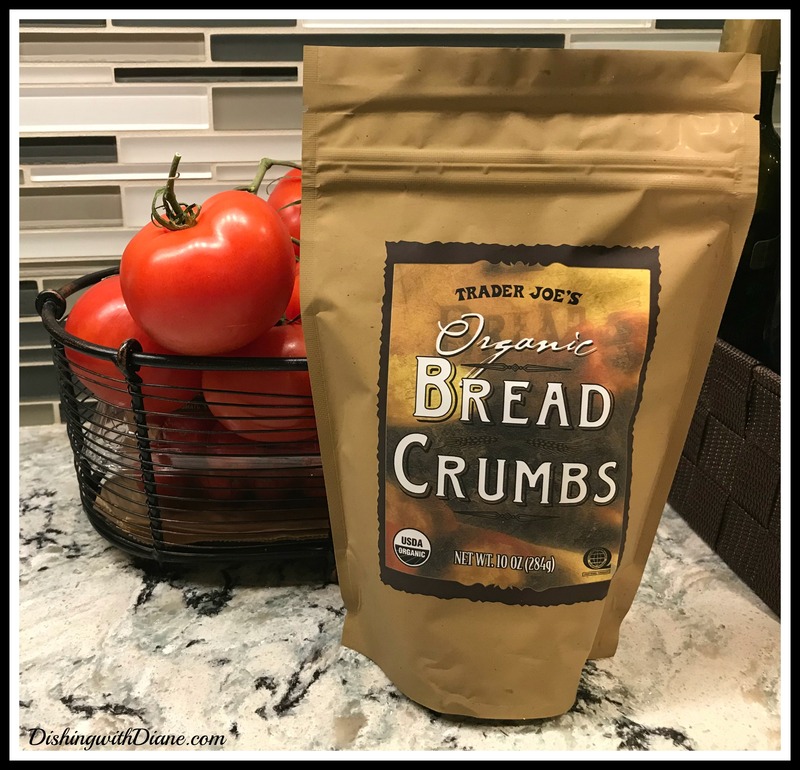 In a food processor, blend all ingredients EXCEPT the oil until smooth…..with the motor running, add oil in a stream, blend until emulsified. 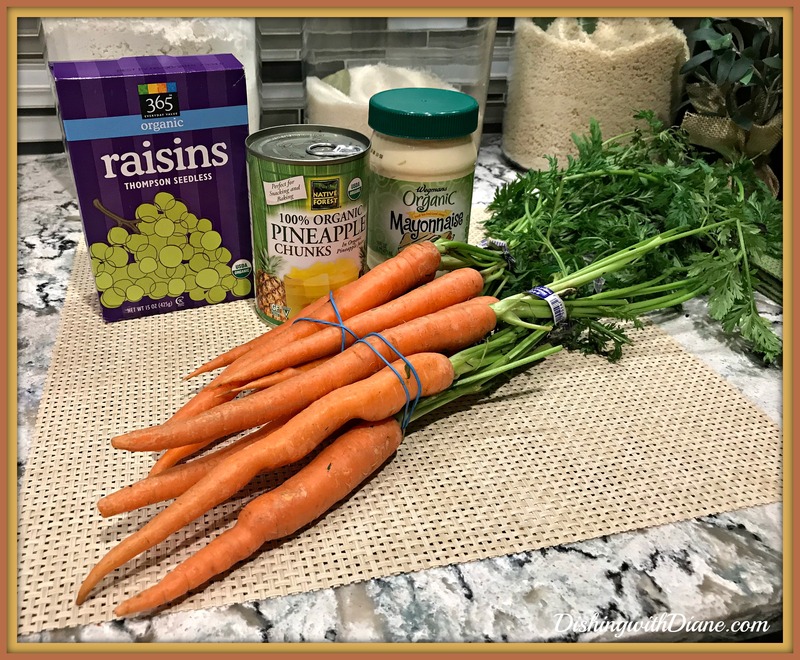 Transfer dressing to a jar and keep it covered and chilled until serving, yields 1 1/4 cup… you can adjust the amounts of the ingredients to your liking. 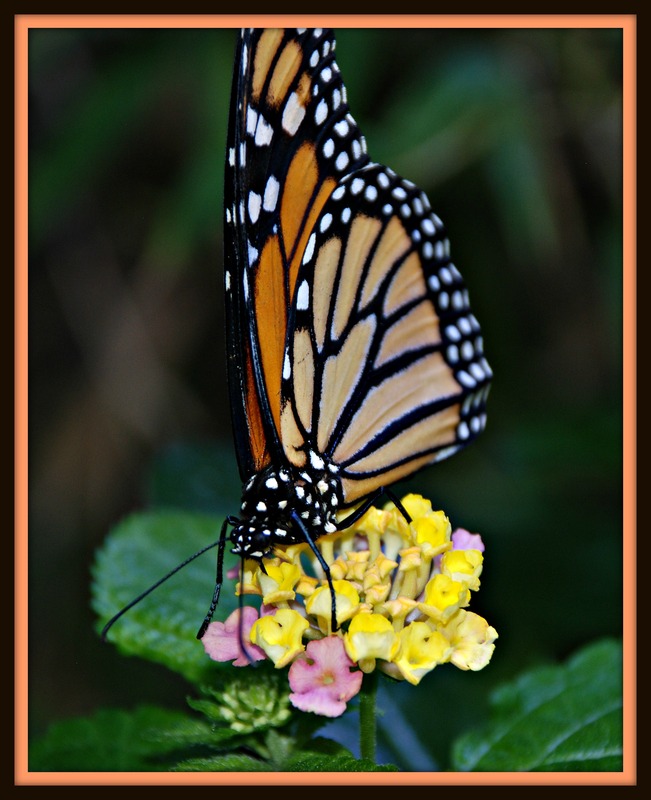 Some of my butterfly photos over the years.. 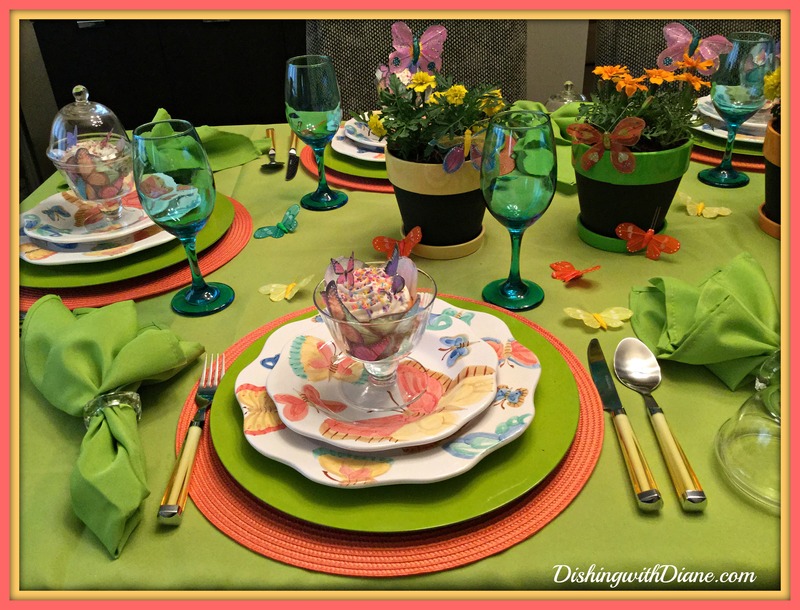 This entry was posted in All Occasion Tablescapes, Chicken, Salad Dressings on May 3, 2015 by aries041158.